The first quarter of 2019 sales at Martis Camp have been met with a season of historic snowfall in the Tahoe area. The incredible ski conditions have fueled additional interest in the Martis Camp lifestyle propelling sales results to near record levels from 2018. As of April 1, 2019, we have closed or put into escrow 13 custom homes and 7 homesites totaling more than $72,000,000 in volume. Final sales numbers for all of 2018 totaled 47 custom homes and 25 homesites closed representing over $280,000,000 in volume. Inventory levels remain low with 20 homes for sale (pricing from; $2,395,00-$12,495,000) and 31 homesites for sale (pricing from; $925,000-$3,895,000). With the excitement for winter still in full effect and the magic of the Martis Camp summer season on the horizon we anticipate continued demand as we head into Q2. 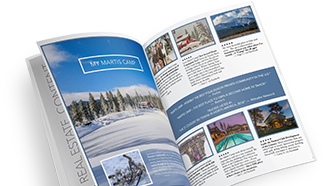 Whether buying or selling a property at Martis Camp please allow our team to share our years of knowledge and market expertise with you. next post: Martis Camp – The whole that’s greater than the sum of its parts.